1) Body - This represents the physical aspect of the change. When one moves to a new location, one has to pack boxes, buy a house, sell off the old, discover new doctors, stores, etc., clean the new place, unpack boxes… Oh, well. It’s a process, best done with detailed check lists. You don’t want to forget something important, like the youngest child. It is easy to focus so completely on the demands of this component of transition, that we ignore our spiritual, emotional, and relational needs. The business mindset of project management, scheduling, and cost containment, is critical for a successful transition. Our minds tend to grasp this fact and highlight this component in orange, lose sleep over it, and then, starve the other two components of our transition. 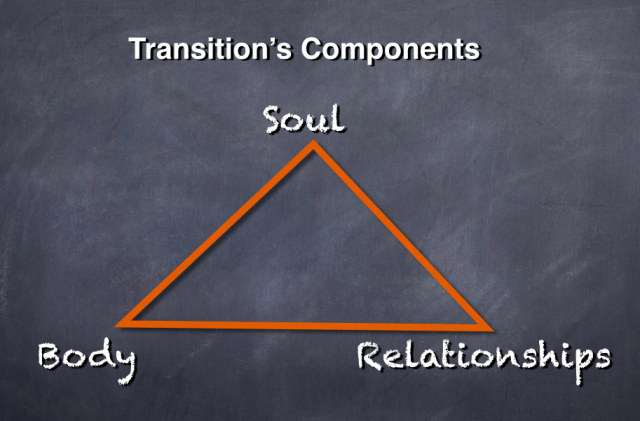 2) Soul - All transitions bring loss. Your soul will journey through the five of the stages of grief: denial, anger, bargaining, depression, and acceptance. Personal growth requires self-awareness. Being spiritually aware during transitions enables us to exit with deep emotional lessons learned. Success as a person depends upon this depth, that only radical and disturbing change can bring. Great souls grow from transition, developing integrity and remaining true to their values under stress. Doing transition intentionally helps us to manage chaos, accept our losses, and be open for the creativity inspired by the new situation. 3) Relationships - Transition forces you to redefine your role as an individual, relative to other persons and the community. You cannot be in the same exact relationship with you parents or friends after you exit puberty. Similarly, you may pack your whole family up for a move to Far Rockaway, but you won’t arrive in the same state of relationship with each other. Your kids will make new friends. Your spouse will develop other interests outside the house. Thinking about our relationships is important during transition. We will be required to make decisions that effect the body and soul of those around us. How we collaborate with them in our choices determines how we will relate with them in the future. Being able to bare our collective souls and talk about loss is often a prerequisite for exiting the transition with a higher regard for each other.